← No Makiwara? No Problem! It may seem like I’m a little obsessed with The Karate Kid, but I’m a child of the 80s–can’t help it! This time I’ll reference the original movie. It was a big influence on my interest in martial arts, but it also informs my teaching to a certain degree. In addition to my interest in karate and jiu-jitsu, I am also a high school teacher. I was talking with a student today who was expressing her frustration about one of her classes. She said she felt like she wasn’t really learning anything, that none of the lessons seem to have a point, and that she wouldn’t be ready for the big AP test lurking around the corner. So I immediately thought of my favorite movie. I tried to explain to her that her teacher was working on the right skills but perhaps in disguise. Sometimes students might think they’re just doing busywork. When Mr. Miyagi tells Daniel-san to “wax the car” and “paint the fence” he’s really teaching his student valuable skills through focus and repetition. This type of learning might be a little dry sometimes, but it’s really important. Most importantly, there is no pressure to learn fast or to please the teacher. There’s no ego drain if Daniel-san screws up a block and gets hit. He’s just learning the motions. There are no distractions. He can practice the basic motions worry free until he builds the necessary muscle-memory. Brilliant! Keep in mind this girl isn’t one of my students: I don’t really teach them anything–hidden or otherwise! I’m not sure if I convinced her, but it reminded me to incorporate seemingly-unrelated teaching and training exercises in my classroom, at the dojo, and at the gym. 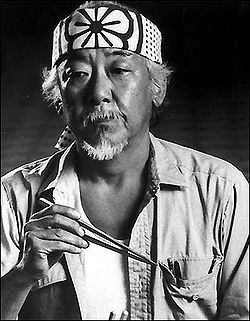 What are some ways you mimic Mr. Miyagi in your art? Leave a comment!